BetOnline has reduced the qualifying criteria for its Bad Beat Jackpot to give players a better chance of winning a lion’s share of the $1 million prize pool. Since it was launched almost two years ago, BetOnline Poker’s progressive Bad Beat Jackpot is won on average once every three months. 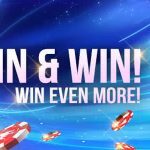 Back in March, the Jackpot was won twice within a week – which didn’t necessarily mean there would be a six-month wait for the next Jackpot win, but that´s how things appear to be working out. Due to long win-less streak, the Jackpot prize pool has grown to more than $1 million ($1,066,675 at the time of writing) and – as the site has done before – BetOnline Poker has reduced the qualifying criteria to make the Jackpot easier to win. Now, when any player has their Quad Eights or better beaten at showdown, every player seated at a Jackpot table will share in the prize pool. BetOnline Poker has a standard set of rules for its Bad Beat Jackpot. Players qualify for a share of the prize pool if they are seated at a specially designated Jackpot table with four or more players dealt into the hand when a player suffers a bad beat with a qualifying hand. Both the winner and the loser of the hand must include both hole cards in the winning/losing hands, and the hand must go to showdown. What´s unique about BetOnline Poker´s Bad Beat Jackpot is that the “standard” for the qualifying hand reduces the longer the Jackpot remains intact. So, after the Jackpot was last won in March, the qualifying hand was Quad Jacks (a player had to lose a hand with Quad Jacks or better in order for the Jackpot to be won). It has since been reduced to Quad Tens and Quad Nines, and is now Quad Eights. In addition to the qualifying criteria being reduced, there have also been a few subtle changes to how the prize pool is divided when the Jackpot is won. 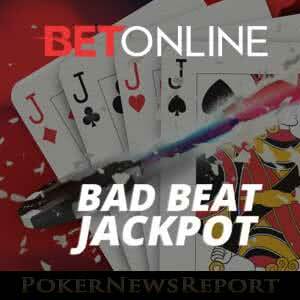 Now, the player who suffers the bad beat receives 17.5 percent of the prize pool – or $186,668 if it is won today. The player who wins the hand collects 12.5 percent of the prize pool plus the money in the pot for winning the hand. The players seated at the same table as that on which the Jackpot is won share 10 percent of the prize pool. So, depending on whether it is won at a Full Ring or 6-Max table, either seven players or four players will share $106,667 equally – provided none of them are sitting out at the time. 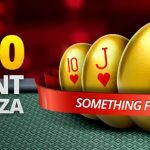 Another 10 percent of the prize pool is divided among every player sitting in at a Jackpot table, while the remaining 50 percent of the prize pool goes towards administrative fees and reseeding the next Bad Beat Jackpot. One of the most noticeable things about the cash game action at BetOnline Poker´s Jackpot tables is that there are many more players sitting on Full Ring (9-handed) tables than at 6-Max tables. Mathematically it is more likely that a Bad Beat will occur with more players dealt into the hand; but, at a 6-Max table, you are likely to be dealt into more hands per hour. It is a difficult question to resolve. If you were sitting at a Full Ring table when the Jackpot is won – and you weren´t involved in the hand – you would win a seventh share of $106,667 – which equates to $15,238. If you were sat at a 6-Max table, your quarter share would be worth $26,666 – a difference of $11,428. It is worth considering, especially if your game is stronger in the 6-Max format. 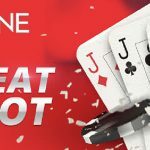 If you have played at BetOnline Poker before, but not visited the site for a while, BetOnline is currently offering players a 100 percent reload bonus on deposits up to $1,000. The reload bonus comes with a free tournament ticket of up to $120 depending on the amount of the deposit. However, you will have to act quickly if you want to take advantage of this promotion as it finishes on October 31st. 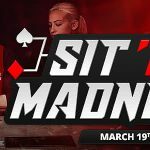 If you have not played at the site before, you are also entitled to a 100 percent BetOnline Poker welcome bonus up to $1,000; but, rather than receiving a free tournament ticket, you will be entered into a First Depositors Freeroll tournament with a prize pool of $10,000. The freeroll tournament takes place on the second Sunday of each month, so you will have plenty of time to hone your skills – and possibly win the Bad Beat Jackpot – before the next First Depositors Free roll tournament on Sunday November 11th.